A flight of Kittyhawks of No. 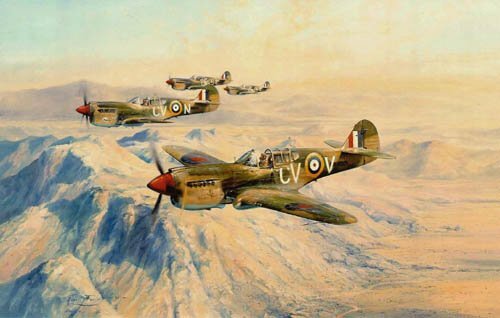 3 Squadron Royal Australian Air Force on a strike mission over the North African Desert in January 1942, in the build-p to the Battle of Alamein. No. 3 Squadron RAAF was the first in the Desert to achieve 100 confirmed victories, and continuing in combat throughout the fighting in North Africa, became the Squadron with the highest number of air victories of the Desert Air Force Squadrons. Each print is individually signed by the artist and FOUR RAAF and R.A.F. pilots.